This picture was taken in March of 1999. 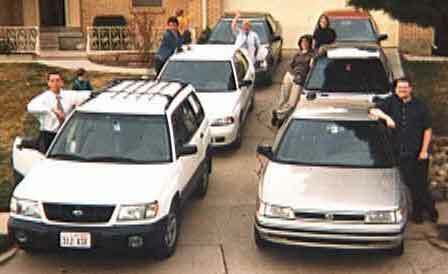 We had a family gathering and i happened to notice that most of the Subarus in the family were present. We rounded up the other two and thought the driveway would be perfect for such a picture. 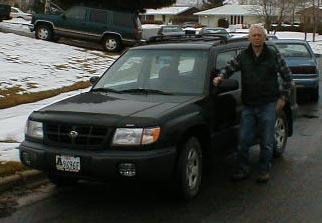 Since this was written up we've added an absolutely identical Black Forester and of course my 93 Wagon. This is Leah's '90 Legacy L FWD. It has a load of miles, 170k+ and is driven daily. Heidi looks on while leaning on her '91 Legacy L FWD. This is Leah's son Matt posing by their 97 Legacy L AWD. 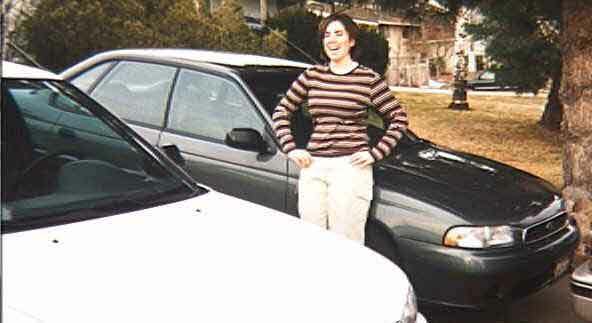 This is Becky standing by her mothers 95 Legacy L AWD. They have only owned it 2 months but they are very happy with it. This is Eileen's Beautiful 98 Forrester. It is a great car and she loves it. This is Tom, Eileen's husband. This Forester was made the same month and year the white one was. They love 'em both.